There many people who are affected by teeth grinding at night and this is a kind of medical disorder which has to be treated. Knowing how to stop nightly teeth grinding can help you overcome the problem. In some rare cases, the disorder is caused by the poor alignment of teeth. Side effects of some medications can also cause this problem, especially if you are undergoing treatment for depression. In most people, teeth grinding occurs when they are asleep and it is necessary to seek treatment to prevent the problem from deteriorating. It can lead to dental health problems and also cause other chronic disorders. You must deal with anything that causes stress in your life. You can also ensure that you set aside enough time to work out – either in a fitness club or by just taking a walk. Yoga exercises and meditation are also effective in helping you alleviate stress and anxiety in your life. This will help you avoid clenching because you will no longer hold onto anger and frustration. You should not drink alcohol or caffeine in the evening to make sure that you sleep peacefully at night; these two substances will affect your sleep cycle and make you grind your teeth while you are asleep. You should visit a mental health counselor to help you deal with emotional issues which provoke anger in you. This is easy because you can also research online for tips to help you relieve tension and anger. Bio feed has been effective in helping people to stop this habit. Your dentist can also be helpful in guiding you on how to stop nightly teeth grinding. The dentist will examine your teeth properly and help you understand the cause of the problem. This ensures that you get the right treatment to help you stop the habit. You can try using an oral splint at night. If you do not have any structural dental problems, your dentist can make a splint which is fitted to prevent teeth grinding while you sleep at night. Most splints are made of acrylic and they fit on the edges of your teeth to prevent grinding. You can find mouth guards at I Love My Smile. You may have a problem in getting some which will fit you nicely and this makes night splints the best. You need something that will not become dislodged while you are asleep. You have to allow your doctor confirm that teeth grinding affecting you are not caused by sleeping disorders. This means that if you grind your teeth because of a health condition like apnea, it has to be treated first. The above are ways to stop nightly teeth grinding. Make sure that any disorder affecting is treated before you can deal with teeth grinding which are usually a symptom of other health problems. 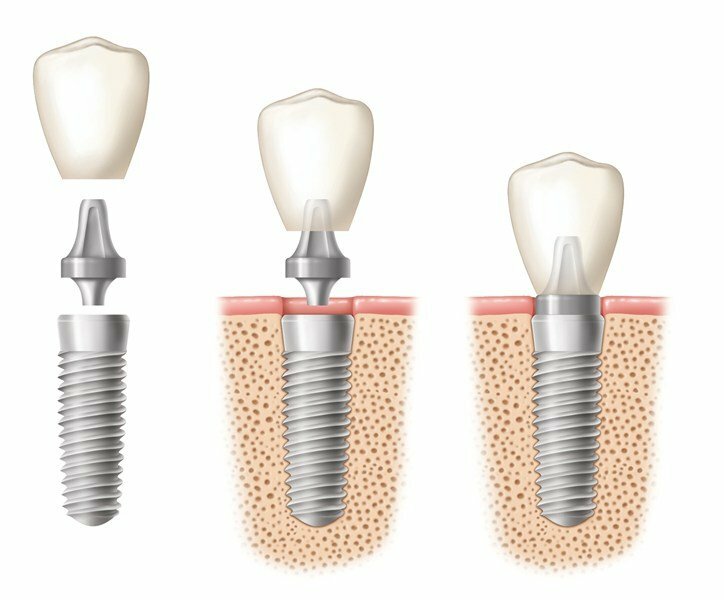 Dental implants are an artificial root device that is placed in the jaw to hold a tooth replacement. It is usually made of Titanium, but other similar dental implants have made use of Zirconia in recent years. It must be noted, however, that only Titanium as a dental implants material has had a long history of success rate. Zirconia, though it may look more appealing as an artificial tooth root because of its tooth-like color, still does not have long-term clinical data. Dental implants are ideal for replacing missing teeth. People who have lost their tooth due to injury, tooth decay, gum disease, excessive wear and tear, or a root canal failure, have the option to undergo dental implants surgery to get the tooth root placed. After several weeks, a crown can be placed on the implant, to mimic an actual tooth. Dental implants can also be placed to support a bridge and do away with the need for a removable (partial) denture. Top quality dental implants can also provide support for a denture, making it more secure and comfortable. This makes the wearer more at ease, without the constant fear of embarrassment a falling or loose denture can create. As with any type of medical surgery or procedure, dental implants surgery also lists a few considerations or patient requirements before the actual procedure can take place. These considerations ensure the safety of the patient, as well as the success of the procedure. First on the list is the need to have good oral health. The gums must be healthy and the teeth beside the implant area should be in good shape. Dental implants may cause complications when done on someone whose oral health is a bit questionable, as the gums and other teeth may not adjust well to it, causing the entire dental implants procedure to do more harm than good. Another requirement is to have enough bone in the jaw, and for it to be strong enough to support the dental implant. In case there is not enough bone or the jaw bone is not strong enough to hold and support the implant, a bone graft should be done. This means the bone should be replaced by one of three different options. These options are: autologous or using bone taken from the same patient from somewhere else in the body. This is usually taken from the crest of the Ilium from the pelvic area or from the person’s chin. The second bone grafting option is allograft or using bone taken from a cadaver from a bone bank. The last option is synthetic, which makes use of calcium phosphates (i.e. materials like hydroxyapatite or other naturally biocompatible substances). When done correctly, a bone graft regenerates and produces live vascular bone that is very much similar to the actual jaw bone. It provides the ideal support and anchor for implants. Bone grafts can take anywhere from two weeks to two months to heal completely. Once healed, the dental implants can be placed. The final consideration for dental implants procedure is the patient’s overall physical health, particularly his blood pressure. To err on the side of caution, dental surgeons do not do the procedure on patients with high blood pressure. This is because most patients get nervous and agitated while in the dentist’s chair, and the procedure might increase their heart rate and blood pressure. It is extremely risky to operate on hypertensive patients. Therefore, if a patient needs implants but is also hypertensive, it is best to bring that blood pressure down significantly and keep it monitored before going through with the dental surgeons do not do the procedure on patients with high blood pressure. This is because most patients get nervous and agitated while in the dentist’s chair, and the procedure might increase their heart rate and blood pressure. It is extremely risky to operate on hypertensive patients. Therefore, if a patient needs implants but is also hypertensive, it is best to bring that blood pressure down significantly and keep it monitored before going through with the dental implants procedure. It should also be noted that one’s hypertension medication should not be a contraindication for the medication one needs during treatment and recovery from the dental implant surgery. Teeth implants cost more than bridges or dentures, but implants offer permanency which bridges and dentures do not. Crowns have to be replaced every so often because of normal wear and tear. Dentures must also be upgraded regularly because it will not always fit exactly as it should. Dental implants, on the other hand, are much durable and will last a lifetime, provided the patient is not into contact sports or does not get into any accidents involving major facial injuries. Dentures have to be cleaned and dealt with separately. They require the use of denture adhesives and their own separate cleaners and cleaning rituals. After the procedure and recovery time, dental implants simply require regular, ordinary routines, like brushing, flossing and gargling. It eliminates fussing with other products other than the basics of good oral hygiene. As with everybody who practices good oral hygiene, regular visits to the dentist must be observed. Dental implants are the most natural looking, not to mention the most natural feeling, alternative to real teeth. Dentures always somehow change the shape of one’s face ever so slightly but making it quite noticeable to the most observant people. Dentures also make the wearer more wary that it might come loose or come off completely at the most inopportune times. This makes the wearer feel unnecessary uncomfortable and insecure. With dental implants, there is zero risk of it coming loose, so the patient does not feel guarded or uncomfortable. It feels just like real teeth once healing has completed. With a reported success rate of 95%, dental implants are perhaps the most reliable option for tooth replacement today. This success rate is highly dependent on three important factors: the experience and skill of the operator or periodontist, the quality of the jaw bone or the bone graft to which the implant will be attached, and the overall oral hygiene of the patient. Post-operative care is crucial too and is an important factor in determining the procedure’s overall success, which is established by the achievement and maintenance of the stability of the dental implants placed. Are you tired of being embarrassed due to having yellowish teeth color? You must be able to know the different ways to whiten your teeth in order to regain your confidence. Having whiter teeth can bring back your confidence as you can always flash your bright smile anytime you want. Teeth whitening need extra effort and patience as you cannot achieve it overnight. 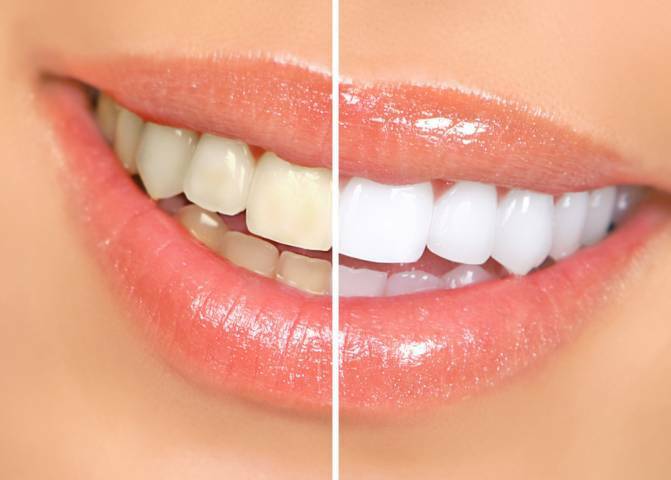 As a matter of fact, whitening teeth can sometimes seem too hard for people who desperately wanted it. All people need to brush their teeth properly on a regular basis. People with a brighter smile can prove to you the essence of regularly brushing teeth. Not only that it can help you maintain a fresh breath but it can also help in whitening your teeth. Brushing of teeth should always be done properly which includes the correct strokes and length of time doing it. Also, you must always ensure to use only the recommended toothpaste approved by many experts. Not all kinds of toothpaste contain peroxide that can definitely help to your teeth whitening. 1. Regular Intensive Dental Cleaning – Teeth whitening can be done through regular intensive dental cleaning. You can visit your dentist and have him perform an intensive cleaning on your teeth to completely remove all the stains on your teeth. This can definitely help you whiten your teeth as your dentist has all the equipment and expertise on cleaning your teeth thoroughly. 2. Teeth Bleaching – Teeth bleaching is another dental procedure you may opt to choose. Teeth bleaching are best to be performed by a dentist in his dental practice though you can still manage to perform teeth bleaching at the comfort of your home. Teeth bleaching involve different ways of removing stains from your teeth. You may use different whitening agents that include whitening kits and strips. However, choosing to have your dentist perform teeth bleaching may give you a more positive result as he has the expertise to do so. Just be sure you can afford it as involving your dentist with this kind of procedure can cost you more. These are some of the ways you might want to consider for you to have whiter teeth. 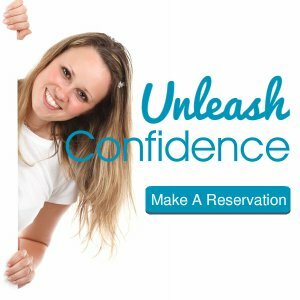 Improving your teeth may definitely regain your confidence that is why you need to make sure that you know certain ways on how you can whiten your teeth. If you happened to apply these ways, you can expect a positive result.